Check out our posts from this last week at the links below. After having the same view for two whole weeks and three Sundays it was really past time to mix it up a little bit. We sure did mix it up in a hurry. We spent the night parked at home Sunday night and then four different places the next four night. Our view out the front window at the Flying J in Effingham, Illinois Monday night. 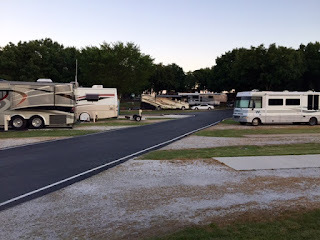 View out the front window Tuesday night at Coachlight RV Park in Carthage, Missouri. View out the front window Wednesday night at Westside Holiness Church in Claremore, Oklahoma. View out the front window Thursday night and beyond at Bethany Revival Center in Wichita, Kansas. We are beginning revival at Bethany Revival Center in Wichita, Kansas this morning. Our first revival here was in August of 2003 and we have been back for revival every year since. This makes our 13th revival for Bro. John and Sis. Judy DiZazzo and all their fine folks. We are excited to be back. I hope you have a great Sunday. Thanks for reading.